In late 1998, GE engineering legend Marty Hemsworth stood at GE Aviation’s Building 500 in Evendale, Ohio, and recalled wandering into the place 50 years earlier like he was an explorer. The building sat in the heart of the massive Wright Aeronautical piston engine factory complex, which had been mothballed at the end of World War II. Within weeks of its closure, acres of factory floor space across several buildings, where more than 25,000 employees had built piston engines from 1941 to 1945, were eerily quiet. GE’s arrival in 1948, followed by U.S. entrance into the Korean War two years later, changed everything. GE’s Evendale operation was born out of necessity. After introducing America’s first jet engine in Lynn in 1942, the GE team quickly developed several follow-on military turbojet engines. But the U.S. government continued to turn over the production of these popular Lynn turbojets to other manufacturers, such as Allison Engines in Indianapolis. The problem for GE was limited production space. So when the company began assembling its popular J47 military turbojet in 1948 in Lynn, GE division chief Harold Kelsey was determined to create more in-house production capacity to keep engine assembly within GE. Encouraged by the U.S. Air Force (USAF), GE set up a second engine assembly operation in the former Wright plant, conveniently an hour’s drive from Wright-Patterson Air Force Base near Dayton, Ohio. The Wright complex was imposing, established on 320 rural acres with thirty-five acres of factory floor space. Designed by Albert Kahn Associated Architects and Engineers of Detroit, Michigan, the Wright complex was among the largest, most sophisticated U.S. factories during World War II. The “Center Machine Shop,” today’s Building 700, was heralded as the world’s largest single-story structure: 1.5 million square feet of floor space unbroken by supporting walls and large enough to accommodate 100 building lots, each 100 by 150 feet. Much of the roof was comprised of glass skylights to allow sunlight to illuminate the shop floor and thus reduce electric lighting. 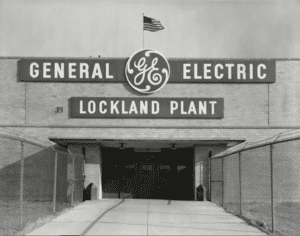 Above: Originally called the “GE Lockland” plant because much of the property was situated in the town of Lockland, it gradually became known as the “GE Evendale” plant after the village of Evendale incorporated in 1952. Top: J47s rolling off the line in 1948 at the Evendale plant. An expanded, two-mile highway was constructed to support traffic flow from Cincinnati and neighboring communities to the new plant. Cutting through the neighboring town of Lockland, this track of highway, incorporated later into Interstate 75, utilized part of the original Miami-Erie Canal bed from the 1840s. (The name Lockland is derived from the canal locks once situated there.) On June 26, 1948, GE publicly disclosed a lease agreement for the “North Shop,” today’s Building 500. Electric Auto-Lite Corporation of Toledo, Ohio, owned many of the buildings, and the federal government owned the property. In October of that year, the seven Lynn managers—Hemsworth, Kenneth Houseman, Claude Auger, Paul Nichols, Robert Hinkle, George Simmerman, and Everett Foster—took a train together from Boston to Cincinnati and literally began to set up shop. To stay close to the plant, some of them rented a house on Springfield Pike in the village of Woodlawn, where weekend card games went well into the night. The “Magnificent Seven” quickly formed a focused production organization and engine assembly line. The Lynn division transferred 150 engineers to help Hemsworth build 14 test cells using dozens of piston-engine test structures from the Wright days. After equipment and tooling arrived, the team began assembling J47 engines components from 250 suppliers nationwide. Houseman, the former turbosupercharger production manager in Lynn, became the plant’s first general manager. In early 1949, at the formal plant dedication, GE Corporate President Charles E. Wilson expressed hope that engines from the new plant “never have to be used to repel an enemy.” It was not to be. Sixteen months later, American troops would be mobilized for the Korean War. The outbreak of war in Korea in June 1950 drove a surging demand for the J47, especially to power the North American F-86 Sabre, the war’s key American fighter jet. The first swept-wing fighter in the USAF arsenal, the F-86 was fast and maneuverable, bolstered by the J47 afterburner. The jet established air superiority in Korea with a 14-to-1 kill ratio in combat with MiG-15 fighters. In less than two years, plant employment swelled from 1,200 to 8,000 behind an aggressive recruitment program throughout the region. The J47 engineering headquarters moved to Ohio, as the engine became America’s most-produced jet engine. For the production ramp, Evendale introduced several manufacturing innovations such as vertical engine assembly to maintain compressor rotor balance and stability. Marty Hemsworth, GE engineering legend. By the mid-1950s, the J47 powered most front-line U.S. military jets, 13 applications in all, including the F-86, the Boeing B-47 Stratojet, the Convair B-36 Bomber, the North American B-45 Tornado, the Martin B-51 Bomber, and the Northrop YB-49 Flying Wing. During that time, the plant also changed its name. 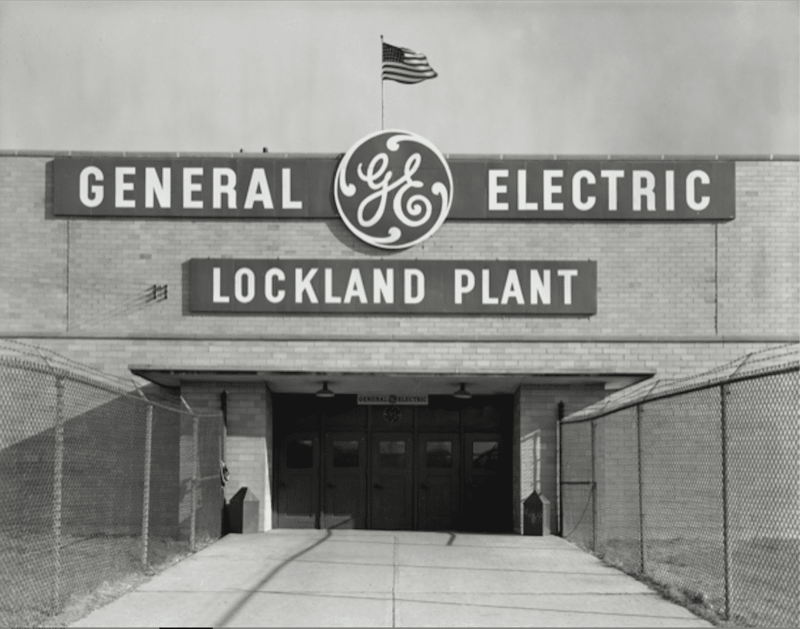 Originally called the “GE Lockland” plant because much of the property is situated in the town of Lockland, it gradually became known as the “GE Evendale” plant after the village of Evendale incorporated in 1952. These days, the plant straddles both Lockland and Evendale. Despite the ups and downs of the cyclical aviation industry, GE’s Evendale plant continued to innovate and thrive over the decades, becoming one of the most important operations in the history of jet propulsion. Over the next 70 years, GE acquired the Wright buildings and added new ones. Now the world headquarters for GE Aviation, the company has invested more than $500 million into the Evendale complex in the past 15 years. Marty Hemsworth, who passed away in 2009, went on to play an integral role to the company’s engine programs over the next 30-plus years. As head of engine design in the 1950s, Hemsworth was involved in the development of the wildly successful J79 fighter turbojet and its commercial variant, the CJ805. After several years in Lynn in the early 1960s, he returned to Evendale to oversee development of the critical TF39 high-bypass turbofan engine. In 1971, he was named chief engineer, a role he held for more than a decade as GE’s CF6 turbofan blossomed into the best-selling engine family for large commercial jetliners. Even after he retired from in 1987, he served as a key consultant on many GE development engine programs. Visiting the plant in 1998, 50 years after he first set foot in Evendale, Hemsworth spoke of many happy memories. Standing in Building 500, he recalled one particular notion from those early days of the jet age made him smile broadly. When the seven Lynn managers set up the plant, the prevailing attitude was that jet engines would never be efficient enough for general passenger travel. Piston engines were still expected to rule the skies. “So much for that idea,” he said. Proudest phase of my engineering career.